Cloudian HyperStore® software-defined storage (SDS) is built on a robust object storage platform that is ideal for managing unstructured data, allowing for massive scalability, geographic independence, and multi-tenancy. With complete S3 compatibility, HyperStore ensures seamless S3 integration with every available AWS/S3 application. HyperStore Storage System is a peer-to-peer software defined storage platform, providing an enterprise grade S3-compliant object storage system on low cost commodity servers. Its multi-tenanted and multi-interface design can support many applications on the same platform. 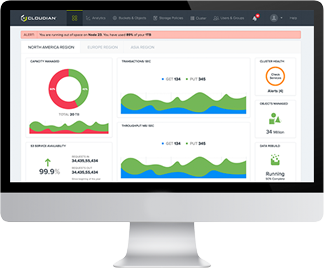 Cloudian HyperStore software, whether deployed on a user’s existing hardware or pre-installed, combines robust availability with system management control, monitoring capabilities and reporting. A host of features, including hybrid cloud streaming, virtual nodes, configurable erasure coding, and data compression and encryption help HyperStore set Cloudian apart with highly efficient storage and seamless data management that lets users store and access their data where they want it, when they want it. Designed to tolerate disk, node, rack, data center and network failures. Build highly cost effective data storage by securely moving data between public & private clouds. Scales on demand. As the system scales it rebalances I/O across the storage cluster. Set usage limits on User, Group and System level and protect against and rogue clients and over usage. With Cloudian’s HyperStore object storage software, the QCT SD1Q-1ULH server with Intel® Xeon® processor D-1500 offers capacity storage at a game-changing cost structure. The solution is based on a peer-to-peer architecture, which means customers simply need to add another QCT SD1Q-IULH to expand their storage pool. Furthermore, the QCT/Cloudian solution takes advantage of the Amazon S3 ecosystem, which includes over 500 compatible business applications and thereby delivers unmatched investment protection. The QCT SD1Q-1ULH server is a great platform for building and deploying Amazon S3-like hybrid storage solutions with seamless mobility to an S3 public or S3-API-compatible private cloud.